I don't usually reach for standard colors when I do a solid color manicure (but let's face it...when have I shown you all a solid colored manicure). However, after applying the base to today's manicure, I know which polish is a new favorite of mine. 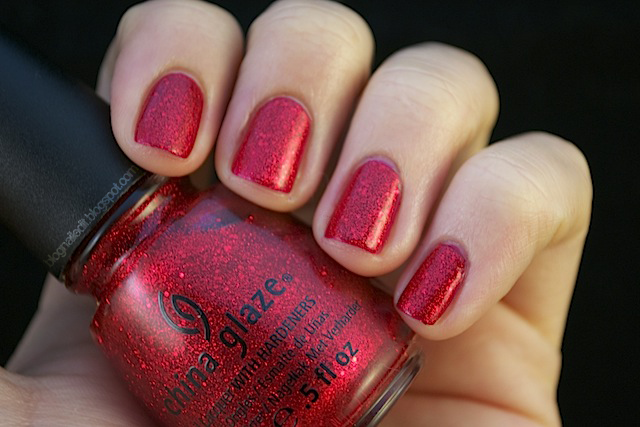 May I present to you in all her glittering glory...Ring in the Red from China Glaze. She's the color so nice, I'll show you twice. I mean come on! It was so damn sparkly I ran over to Andy absolutely tickled! His words: "It's so...shiny!" Yes it is my man, yes it is. I couldn't leave well enough alone though, and pumped it up with some holiday glamor. I stamped using Cherish, also from China Glaze, and Sinful Color's Fashionista adorned the half-mooned cut off point. The plate is RA-110. 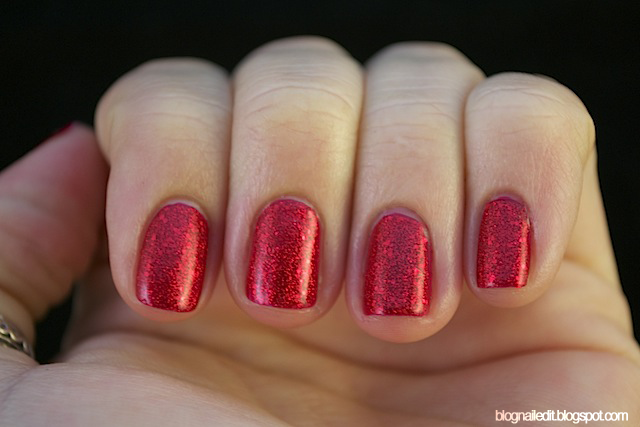 I should also mention that beneath Ring in the Red I used one layer of Essie's Limited Addiction, just so I wouldn't be glopping on layer upon layer of that gorgeous glitter to get full coverage. This is lovely. 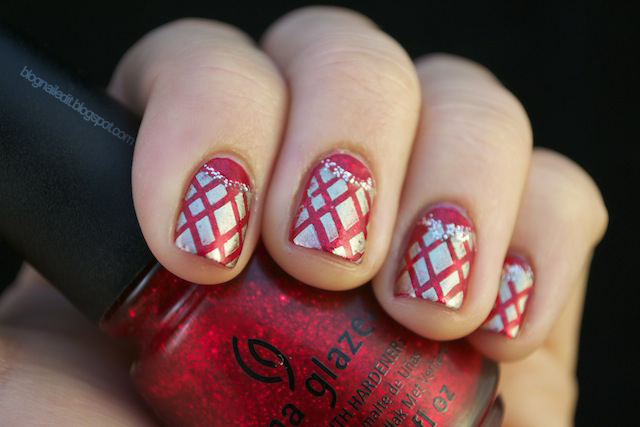 Just Christmas-y enough :) I really like your version of the half-moon mani. I LOVE this colour. At first I thought that I may not get it, and then I saw it in person! So freakin' gorgeous!! I really like the design you added, and the glitter. So pretty! @Courtney Thank you Courtney, you're so kind! Welcome, and enjoy! I have limited addiction and love it! Love this stamp design. Need to use it myself!